This article covers a submitted workflow. Sumbitted workflows are currently under consideration to be utilized by the development department(s). This article lists all graphics-related aspects that we've upon yet. PARPG will use only square-shaped grids. Hex grids will be considered only in case we run into unresolvable engine or game mechanics problems with the square grids. 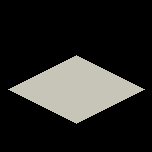 PARPG will use an isometric perspective as seen in most isometric games out there - A basic tile will have sides that go 2 pixels to the side, 1 pixel up. In Blender terms this means 45° z rotation, 60° x rotation for the camera. Basic tile shape and perspective. This is how big the average human will be. This page was last modified on 3 February 2011, at 08:41.